These two very special Pharaohs were possibly brothers or at the very least half brothers and together they mark the transition from and end of the Armana period. However, they both pose a mystery almost as great as that of Akhenaton. There is much physical evidence that pieces together a good mystery regarding Tutankhamon, including his actual body which to any detective is an essential element in the equation. As for Smenkhare we have a body and a tomb but very little else. The young Smenkhare was the Co-regent of Akhenaton after the disappearance of Nefertiti but he reigned for only a few months after the ‘departure’ of his predecessor. The nine-year-old Tutankhamon succeeded him. He was more than likely a very close blood relative, possibly his brother, or at least half-brother. Influenced by the high priest Aye to change his name to Tutankhamon, he brought into effect the restoration of the old worship. The mystery of Smenkhare is so bizarre that in reality it is perhaps the most horrible thing that could ever happen to an Ancient Egyptian. He was buried in a tomb without any inscriptions. Even his face was defaced and the cartouches on the mummyform coffin were removed. This meant that he was condemned to an existence for eternity in the tomb. He quite literally could not escape. Aye had ritually buried the Aton and entombed it forever. It was more than likely that Smenkhare was murdered by the connivance of Aye and possibly Horemhab. However, there is even greater evidence for the murder of Tutankhamon by Aye, for he stole the young boy king’s tomb and forced his young widow to marry him so he could ascend the throne. The reason for Tutankhamon's murder was that according to the evidence of his new throne that bore the sacred image of the Aton, he was reverting back to the worship of the Aton. As he reached adolescence he wanted to be free of the restraints placed upon him by the ageing Aye. He perhaps longed for the beauty and freedom of Armana where he undoubtedly spent his infancy and boyhood. That must have been paradise compared with the stuffy pomp of Thebes with the priests of Karnak wanting to rule the country through him in the name of Amon. Tutankhamon was given a reasonably lavish burial in a hurriedly made vault in the Valley of the Kings. Howard Carter only found it because its entrance was used as a dumping ground for rubble during the construction of the nearby tomb for Horemhab who succeeded Aye after his short reign of 4 years. What we must note is that very many of the artifacts found in the tomb of the boy king are in fact items belonging to his brother, Smenkhare. Compare the faces on the two coffin lids, they are totally different. The second, more elaborate one bears the features of Smenkhare whilst the solid gold coffin bears the likeness of its occupier Tutankhamon. This would have been the work of the cunning Aye, not wanting to waste anything from the despoiled tomb of Smenkhare. He simply had the cartouches changed for the new recipient. A simple deception that ensured nothing went to waste, especially as very few people would ever see the middle of the three coffins, so as long as the solid gold innermost and the outermost coffins bore the real likeness then none would be any the wiser. Akhenaten is probably the most interesting of Egyptian pharoahs. He was strange in a number of ways, an oddity that upsets the normal course of Ancient Egyptian history and gives rise to theories that are still being argued about amongst archaeologists. It is not for me to enter this great debate; I merely suggest a scenario that fits as well as any other to the known facts. 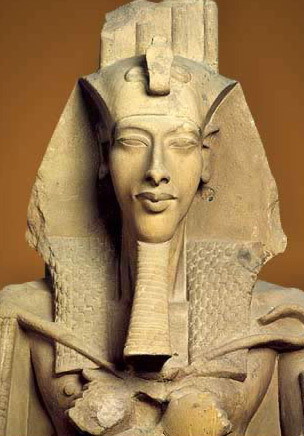 Akhenaten’s reign (about 1353 BC - 1336 BC) was a hiccup in the great tradition of the pharoahs. For centuries before and after him, little changed in the style of Egyptian art and their beliefs; tradition dictated and the pharoahs followed. Only Akhenaten dared to be different. In his reign art became suddenly more realistic and family-centered. The stiff and formalized depictions that we are so used to in Egyptian art loosened up and we are allowed a glimpse into a more human and natural world. It is for this reason that we can be fairly certain that the pharoah and his wife, Nefertiti, are accurately portrayed by their artists. And Akhenaton looked weird, to say the least. His body was pear-shaped and his limbs thin and elongated; his face too was long and narrow. There has been much speculation on the cause of these apparent deformities, most settling for Marfan’s Syndrome, a genetic disorder that fits closely with what we observe. His birthday was celebrated by an annual feast, the natales Apidis, of seven days’ duration, during which it was supposed the crocodiles were innocuous, and a silver cup was thrown on the occasion into a certain part of the Nile, which was considered a flux of Apis. This festival coincided with the rise of the Nile. The oldest Apis mentioned was one of the reign of Amenophis III., and he was followed in the 18th dynasty by bulls which had died in the reigns of Tutankhamen and Horus. There was a succession under the 19th dynasty, commencing with Seti or Sethos I., besides three which died in the 16th, 26th, and 30th years if Rameses II., and three others, the dates of whose deaths are unknown. Under the 20th dynasty there was an Apis which died in the 26th year of Rameses III., one in the reign of Rameses IX., others of the date of Rameses XI. And XIV., and four others whose dates are not determined, besides three more which died under the 21st dynasty. Of bulls deceased in the 22nd dynasty, there is one of the 23rd year of Osorkon II., another of the 14th year of Takellothis I., and a third of the 28th year of Sheshank or Shishak III. It is not till the reign of this monarch that the dates connected with the Apis become of chronological importance. On the sepulchral tablet of the Apis which was born in the reign of Shishak III., is found the formula of the date of the birth and inauguration of the bull. It was born on the 20th of the month Payni, in the 28th year of the king’s reign, and enthroned on the 1st of Paophi of the same year, having died in the 2nd year of the king Pamai, and been buried on the 1st of the month Mechir of the same year. It had attained the age of 26 years. Three other bulls died in the 4th, 11th and 37th years of Shishak IV. Important statements like these show the intervals of time which elapsed between the regnal years of different kings, and check the chronology of the 22nd and subsequent dynasties, but owing to unfortunate lacunae the chronology of Egypt is conjectural, and not positive till the reign of Tirhakah. The dates of the other Apis are, one which died on the 5th of the month Thoth, in 6th year of Bekenrenf, or Bocchoris, another of the 2nd year of Shabak or Sabaco, and that buried on the 23rd Pharmouthi of the 24th year of Tirhakah, 730 B.C. The dates of the other bulls prior to the conquest of Egypt by Alexander the Great, 332 B.C., are: one born in the 26th year of Tirhakah, enthroned on the 9th Pharmouthi, the same year deceased, in the 20th year of Psammetichus I., and buried on ! the 25th Paophi, of the 23rd year of Psammetichus; another deceased in the 52nd year of the same king; a third born in the 53d year of Psammetichus I, enthroned on the 12th of Athor of the 54th year, deceased on the 6th of Paophi, and buried on the 10th Choiak of the 16th year of Necho, having lived 16 years 7 months and 17 days; another born on 7th Paophi of the 16th year of Necho, enthroned 9th Epiphi of the 1st year of Psammetichus I., died on the 12th Pharmouthi of the 12th year of Apries, and buried the 21st Payni of the same year, aged 17 years 6 months and 5 days; another born in the 5th year of Amasis, inaugurated on the 18th Payni of the same year, died on the 6th Phamenoth, was buried on the 15th Pashons of the 23rd year of the same king, aged 18 years and 7 months. The Apis which died after this, and of which a sarcophagus was found dated in the 4th year of Cambyses, is the one supposed to have been killed by Cambyses on his return from Aethiopia. Another born in the month Pharmouthi of the 5th year of Cambyses, died in the 4th year of Darius, and was buried on the 2nd Pashons of the 5th year of darius, and had lived upwards of 7 years. It is the Apis of Darius, alluded to by Polyaenus, for the successor of which Darius offered 100 talents as a reward to the fortunate discoverer. Another Persian king Ochus is said to have killed and eaten an Apis, 338 B.C. The death of an Apis soon after the death of Alexander the Great, 323 B.C. is also recorded. The sepulchral tablets in the demotic characters according to M. Brugsch, record the birth of an Apis in the month of Phamenoth, in the 29th year of Ptolemy Euergetes I., 231 B.C., which died in the 51st year, 179 B.C. ; and another older, probably of Ptolemy Philadelphus II., 253 B.C. ; another of the 14th year of Ptolemy Epiphanes IV., 211 B.C. ; another in the 20th year of Ptolemy IV., 185 B.C. ; another in the 17th year of Ptolemy Philometor VII., 164 B.C. ; and another born in the 53d year (118-117 B.C.) of Ptolemy Euergetes II., died 15 years old, 103 B.C., in the reign of Ptolemy XI. In the Roman times the discovery of an Apis in the reign of Hadrian, 121 A.D., caused a tumult at Alexandria; and the last known Apis is that brought to the Emperor Julian II., 362-363 A.D., after which the Apis disappears from Egypt altogether. The Apis was embalmed at great cost, but the operation consisted in preparing with bitumen the skull and a few of the principal bones of the bull made up into an appropriate shape. The second genius of the Karneter, or Egyptian Hades, was also called Hapi or Apis, but he was quite distinct from the bull god and the son of Osiris. His type was that of a human mummy with the head of a Cynocephalus ape. Bronze native figures of the Apis are not uncommon, and those of stone are occasionally found, but porcelain ones are extremely rate. Lepsius, "Ueber den Apiskreis," Zeitsch. D. Morgenl. Gesellsch. vii Bd. 1853; Brugsch, Ibid. ; Mariette, Le Sérapéum de Memphis, 1857; Jablonski, Pantheon, ii. (S. B. )The above article was written by Samuel Birch, D.C.L., LL.D., Keeper of the Egyptian and Oriental Antiquities, British Museum, up to 1885; Rede Lecturer at Cambridge, 1876; author of History of Ancient Pottery, The Papyrus of Nashkem, Cypriote Inscriptions, and other works on archaelogy.